Just before winter ended, we got together for an awards ceremony to commemorate ourselves, the 53rd winter-over crew. It was an unexpected event for me. They didn’t have it at the end of summer, so I didn’t know why they would have it at the end of winter. We filed into the galley in good spirits. Winter was coming to a close and most of us were looking forward to the end. We were awarded our certificate, Antarctic Service Medal, and thank you gift in order by the number of winters completed in Antarctica. I’d guess that half of the 125 people were on their fist winter. There were plenty of second timers, but then it quickly dropped off until we had just three people with eight winters, none with nine, and just one with ten full winters. I heard a number of the first years groan and wonder if they could do this nine more times. It is an amazing commitment to the program and lifestyle. The service medal was a surprise. I feel that medals are for the service men and women of our country that put themselves in harms way. I couldn’t believe anything about this adventure would warrant an official medal. Someone else has disagreed since 1946-47 when the participants of the US Navy’s operation High Jump under Admiral Byrd received the medal (thought it wasn’t established until 1961 by Congress which I don’t completely understand). Of course, back then there was a lot more risk so it would be more justified. Currently, anyone who serves at an Antarctic research station or vessel and remains south of 60 degrees South for at least 30 days is eligible. No one from this past summer has received them yet because there is a five year waiting list. There are less winterovers so we get them while we are here. 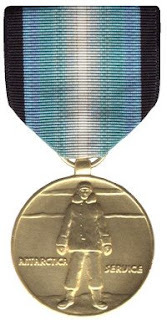 The front of the medal has a man who represents courage, devotion, and honor. His uniform is modeled on the one worn by Admiral Dufek who led the advance party to establish the first permanent station at the South Pole. The ribbon is made of up five-twelfths of black and dark blue bands to represent the five months of total darkness that we experience in the winter. The medal is complimented with a clasp that says “Wintered Over” for those who spent the dark night here. 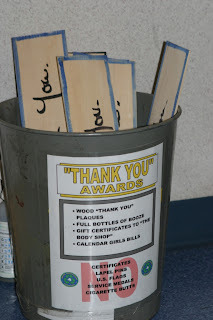 A specially made recycling container for Thank You gifts. The best part of the ceremony was probably the thank you gift that our station manager handed out – a piece of wood with ‘Thank You’ written on it. Traditionally, the company buys an article of clothing to commemorate each year’s winterovers. Unfortunately, that was cut from the budget this year which led to some resentment. In the days following the ceremony, that resentment was transformed into some entertainment. Another way to reuse your Thank You gift.